We all know the feeling of waking up on a Saturday with a dry mouth and pounding head, and insisting that “the last pint was off”. A sure fire solution to that rubbish feeling is a fry-up, and we always advocate brunch at JuJu’s for those afflicted with B.R.Y. (Booze Related Yuckiness). The lads at Big Papa’s aren’t offering breakfast, but definitely offer food for the soul that will sort that griping stomach right out before you get back on it on a Saturday afternoon. Think New Orleans southern flavours, spicy fruity chutneys, utterly crispy fried chicken, and unctuous slow cooked beef and pork. Although they’re a street food venture, presently they have residency at The Sunflower Lounge on Smallbrook Queensway. That venue is no doubt familiar with many of you as it’s been serving up the best of indie live music for a decade. It has been recently refurbished and while it’s lost none of its edgy charm it’s now somewhere you wouldn’t mind eating in! 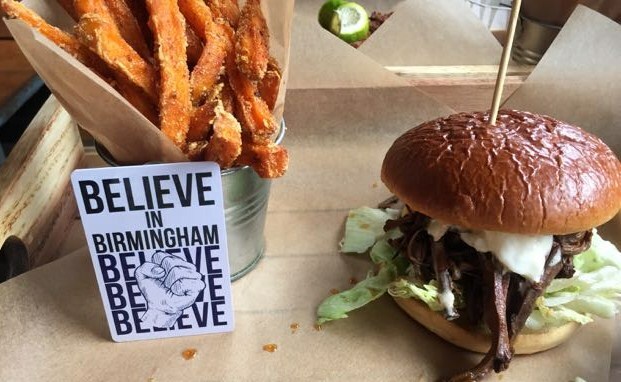 The Sunflower lounge also take part in the Independent Birmingham card which gave us 10% off food and drink (check website for details, we’re not affiliated, we just happen to use it). We went along for a Saturday lunch ahead of some afternoon shopping and drinking. We knew the portions were large so skipped the starters, but on offer were blackened shrimp, spicy fried okra, and buttermilk hot wings, all £5. 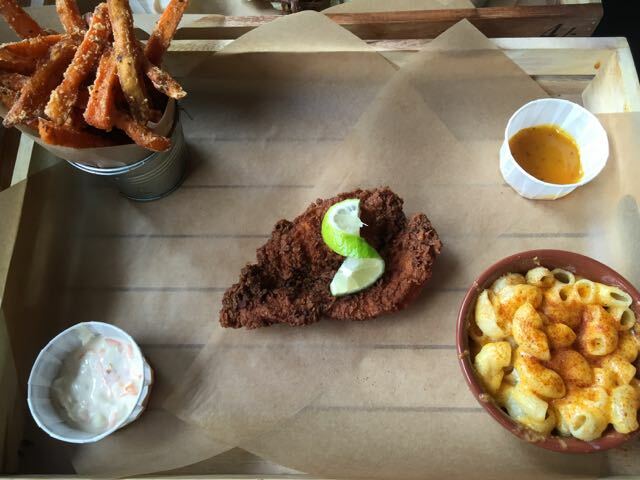 The mains are served with two sides, all for £10. I had the buttermilk fried chicken which was truly the crispiest most succulent bit of chicken I’ve ever had. It was served with a lip tinglingly spicy mango chutney, coleslaw, and a lime wedge. I had two carbtastic sides with mine though one would’ve been plenty for all but the most ravenous. 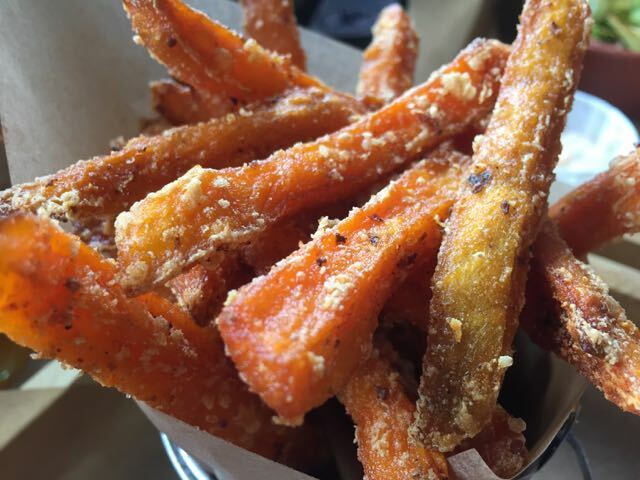 The sweet potato fries were the best I’ve ever had, golden and crisp on the outside, sweet and soft on the inside. My other side of mac’n’cheese was a meal in itself – al dente large pasta tubes (maybe gomiti – there are too many pasta names to know them all) lightly coated in a rich cheese sauce topped with smoked paprika. If that lot won’t sort a hangover out, nothing will. The other main we tried was cola cooked pulled beef brisket on a brioche bun. The sweet savoury flavour of the meat was delicious with the spicy fruit chutney and cool coleslaw. If you’re hungry after all that lot then they offer some desserts including Mississippi mud pie, or blueberry pancakes – all a fiver. For £20 here you can have three courses of great quality tasty grub. I’m not really sure how places like Five Guys can be busy when this superb offering is just 5 minutes away. Well done guys, I suspect there are more great dishes to come out of your kitchen. This entry was posted in Area: Central Shopping, Area: China Town, Area: City Centre, Cuisine: Modern Mixed, Cuisine: US Southern Soul Food, Price: Cheap as Chips - Inexpensive, Venue type: Bar, Venue type: Entertainment, Venue type: Pub and tagged Birmingham Restaurant, birmingham restaurant review, birmingham review, eating out in birmingham, Out In Birmingham, out in brum, OutInBrum, restaurant review, where to eat in birmingham, Where To Go In Birmingham, where to go out in birmingham. Bookmark the permalink.